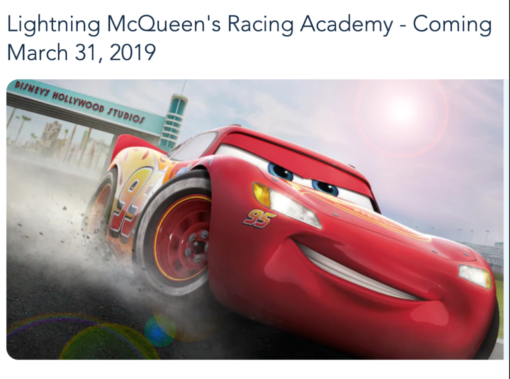 Lightning McQueen’s Racing Academy is officially open in Hollywood Studios. This new experience brings guests into the world of “Cars” and helps them become rookie racers by learning from the non other than Lightning McQueen himself! The show lasts 10 minutes and guests will also get to see other favorite characters from the “Cars” movies, like Mater and Cruz Ramirez. What’s really cool about this show is that Lightning appears on stage live! During the show, while he is sharing what he has learned from his years in racing, things don’t go as planned. Of course, Lightning’s friends are there to help him out and help him to get the show back on track. Check out this video from Disney about the new show. This new show looks pretty cool, and the Lightning McQueen animatronic looks amazing! Even if you are not a Cars fan, I think this would be fun to see. Once guests have experienced the racing academy, they can step outside to meet Cruz Ramirez. Also, keep an eye out for DJ and his music on wheels with “DJ’s Ready! Set! Party Time!” experience. There are lots of things going on in Hollywood Studios right now, so make sure to stop over and check it out! Are you excited to see Lightning McQueen’s Racing Academy?